I hoped that wasn’t an omen. But when we get there – a journey through a strange, empty industrial landscape that feels like we’re driving to the edge of the moon – we find the most amazingly vibrant scene. Big, buzzy, loud and filled with young energy, this is, instantly, a place you want to be. Waiters push carts around, giving it a faintly street feel. 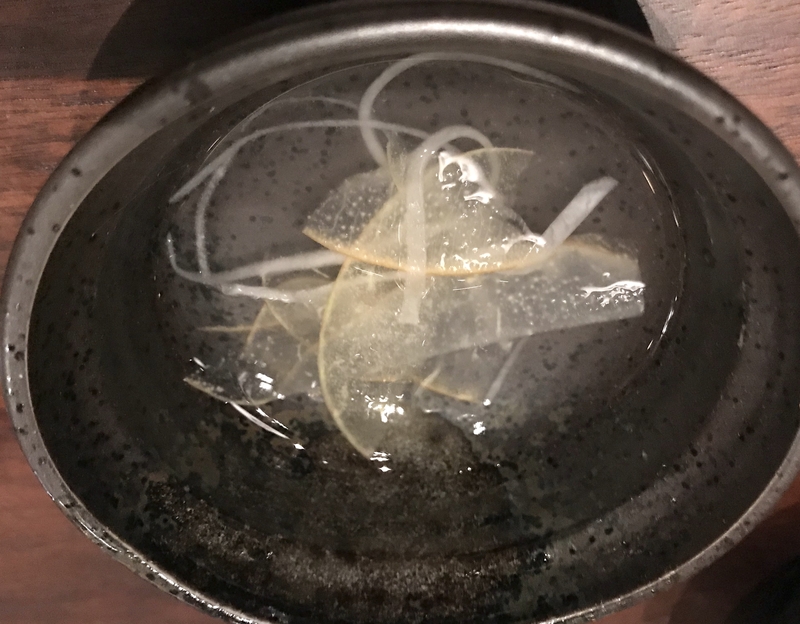 This is the first flavor, a water kimchi so refreshing I find myself picking up the bowl and inhaling the brine. 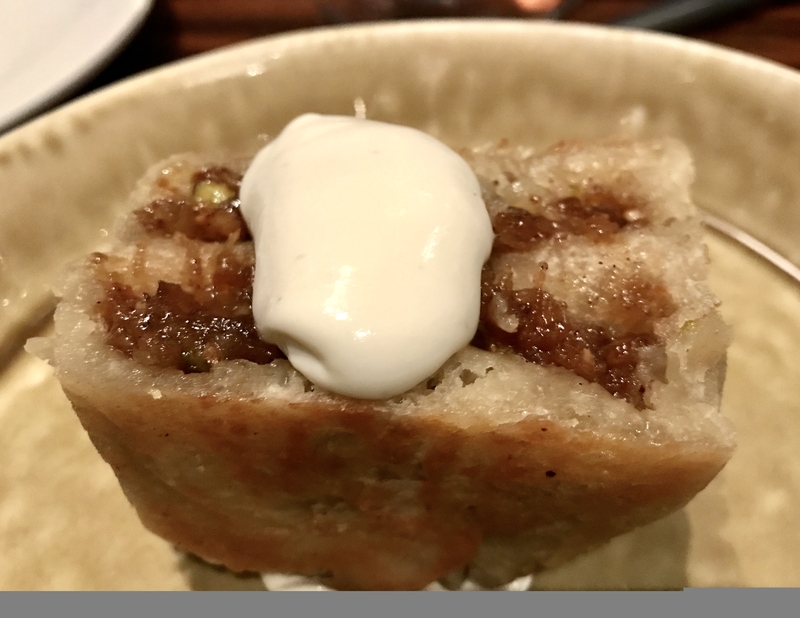 Then there are bings – flat breads with various toppings you dip into or roll inside. I love them all – the spicy lamb, the eggplant, but most of all the chickpea hozon, a smooth velvety variation on humous that puts all others to shame. 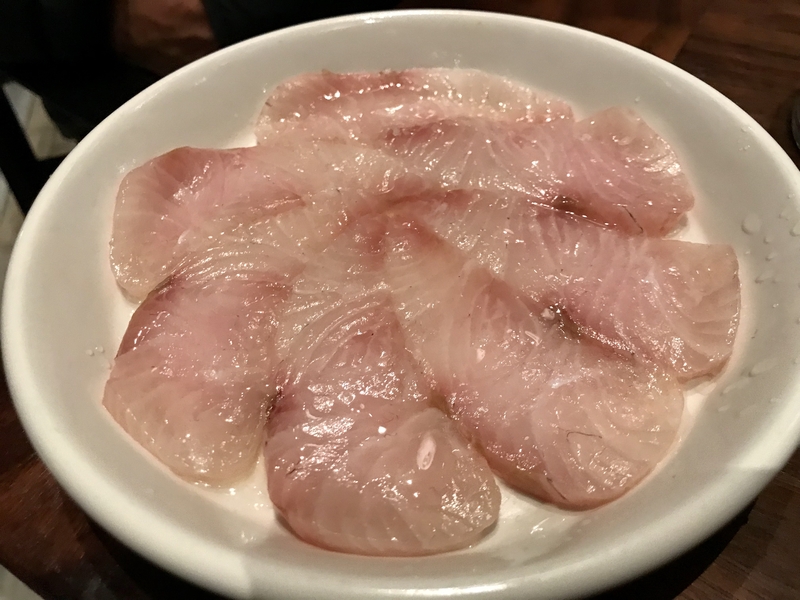 This is sliced kampachi. The fish is delicious. What is better, however, is the bonji that comes with it. A variation on soy sauce, it’s made of fermented rye. I am deeply tempted to drink the entire bottle or – better yet – pocket it and take it home. Look for it in your future. 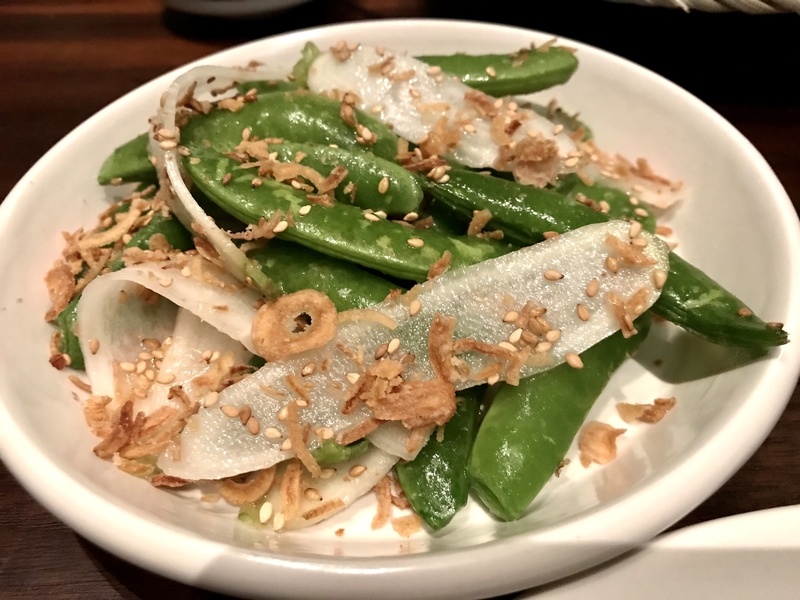 Lots of great vegetables here; I especially like the raw sugar snaps with horseradish and fried shallots. 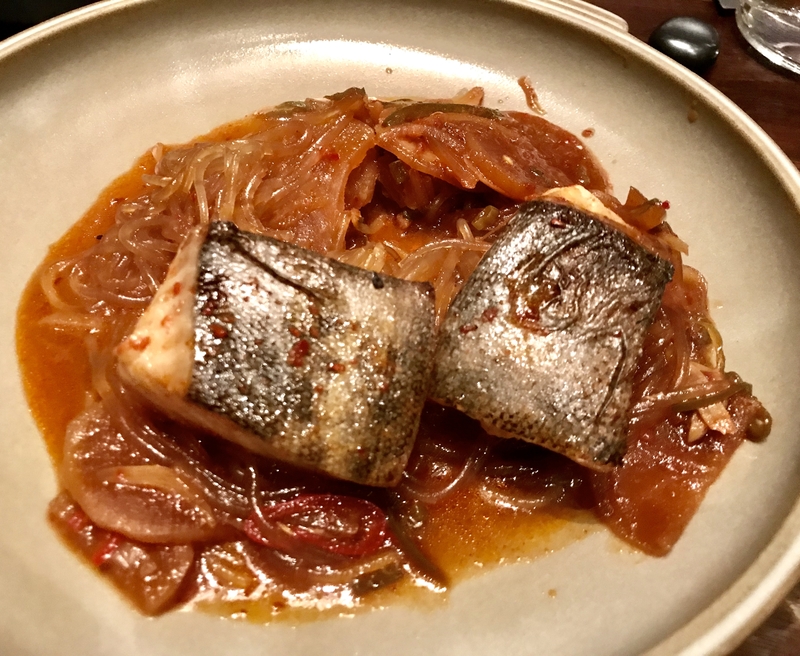 Black cod is the silkiest, richest fish I know. It’s so filled with fat it’s almost impossible to ruin. Still, I really love this version with noodles, daikon and chilies. 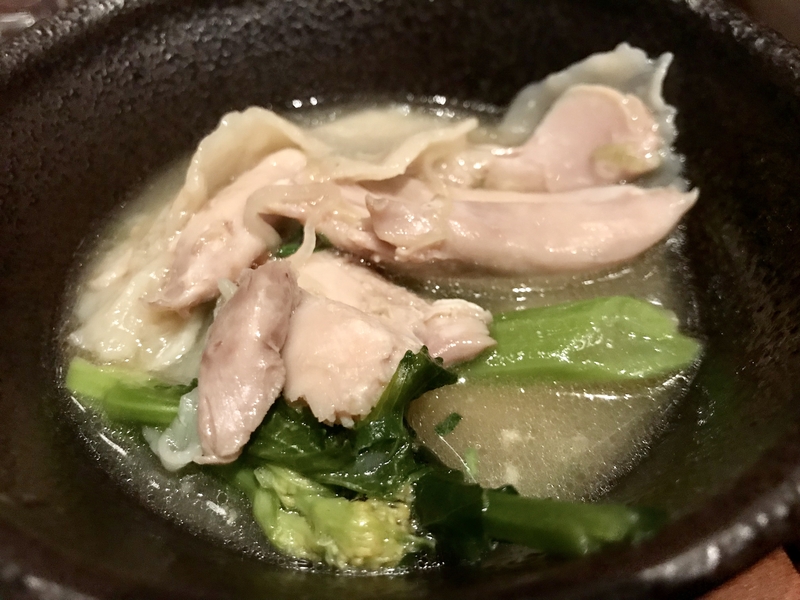 Boiled chicken always looks so pathetic and vulnerable, and the whole one at Major Domo (it easily feeds three) is no exception. Carved and plated with those two sauces it becomes a lot more attractive. 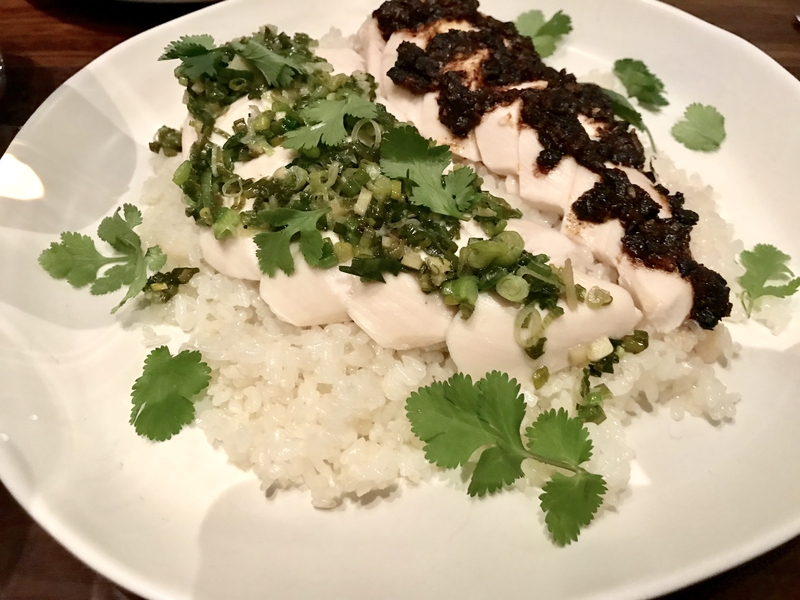 I especially like the ginger-scallion concoction, which reminds me of the one at New York Noodletown that was so wildly popular with French chefs in the early nineties. Whole chicken, round two: made into soup with hand-torn noodles. Simple and totally satisfying. 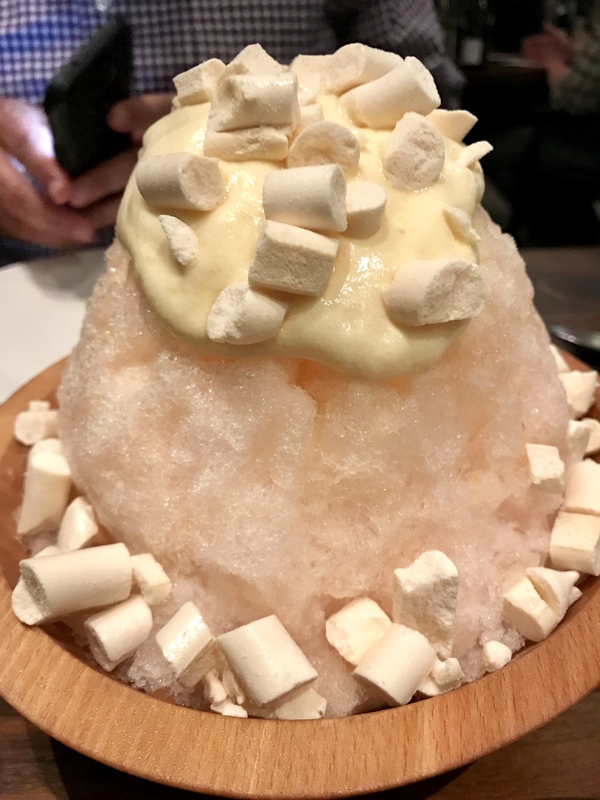 There are only two desserts: This is the ying, an utterly irresistible mountain of shaved ice, fruit and meringue, a take on a Japanese kakigōri. 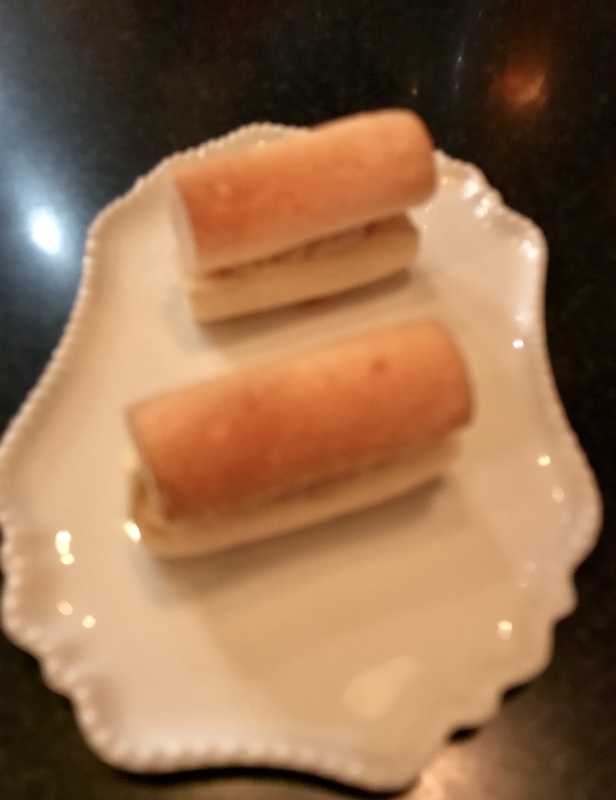 And here is the yang: smaller, more compact, and equally appealing, this is a kind of Korean hotteok, little cakes stuffed with a rich mixture of dates and sesame. As we sit there, eating dessert, we watch enviously as whole plate short ribs – great big bones – are wheeled across the room. They look so delicious. 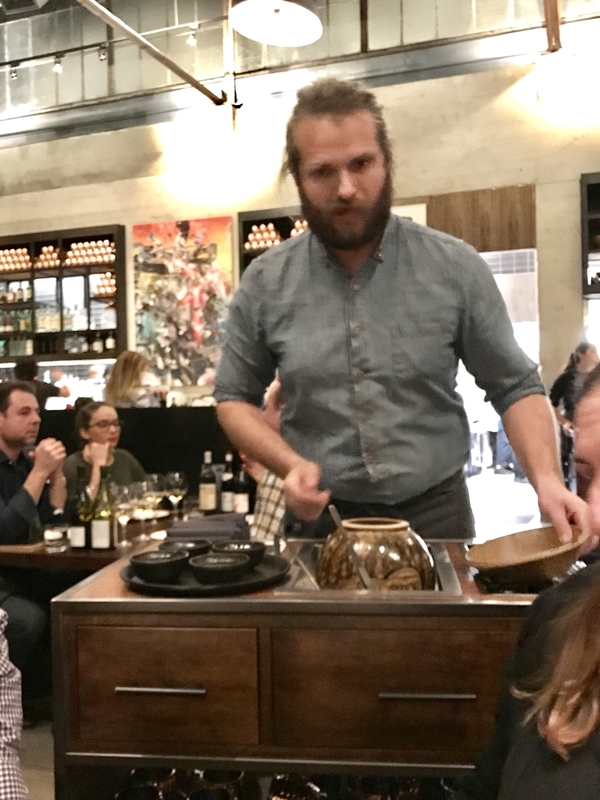 So does the braised boneless short rib as it is dramatically finished at the table with gooey scrapings of melted raclette cheese. And why didn’t we order the signature Chang spicy bo ssam? I’ll just have to go back. Suppose a friend, who happened to be a terrific chef, went off on vacation. Suppose that instead of boring you with photographs you’d rather not watch, he came home and described the trip by feeding you a slew of delicious dishes? That’s pretty much the premise behind Maude. 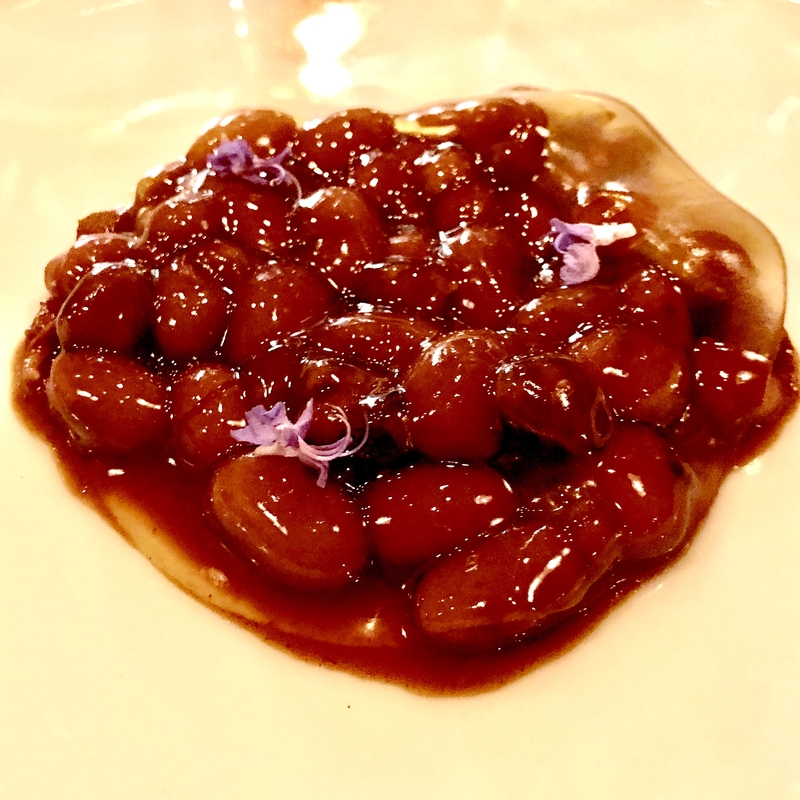 Curtis Stone and his chef, Justin Hilbert went off on a chef’s tour of Rioja a few months ago. You can read about their trip here. Or you can go to the restaurant and eat it. Frankly, I’ll take the food route. 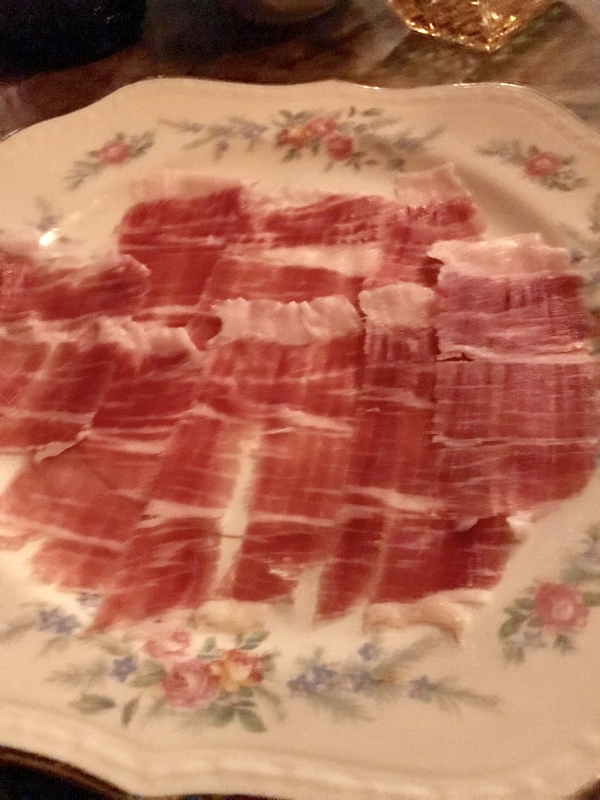 The voyage begins upstairs in the wine cellar, a comfortable romantic little room where you sit sipping Spanish vermouth, eating olives, almonds and soft rosy slices of jamon iberico. Then it’s downstairs to dinner. If you’re lucky you’ll be sitting at the counter, where you can watch Justin painstakingly plate the first dish of tiny vegetables. 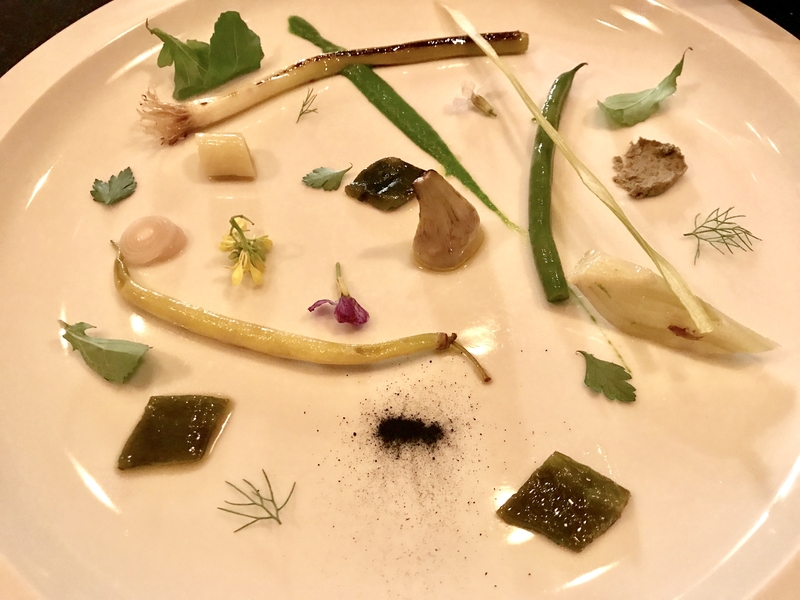 An ode to the garden at Venta Moncalvillo, this isn’t really food – it’s a painting on a plate, just a little something to whet your appetite. But this journey is as much about wine as it is about food; if you’ve ever craved a Rioja seminar, sommelier Andrey Tolmachyov is your man. The first wine, new to me, is Palacios Remondo Placet 2015, which has a lovely edge of bitterness at the back. It’s followed by a tempranillo blanco- a grape of which I have remained ignorant for my entire life.. 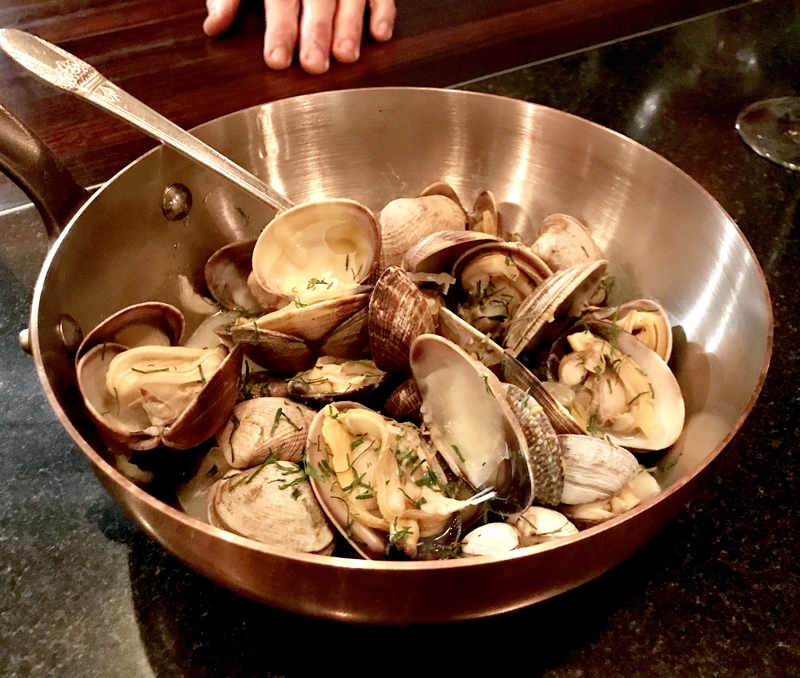 The Ad Libitum is lovely – and what’s even lovelier is that these clams are cooked in the same wine (along with oranges, bergamot and a sofrito). You’ll want the bread to dip up every bit of the delicious broth. Next up, this very cheffy version of the classic Catalan tomato bread: meringues, roasted garlic and just the faintest rumor of tomato. 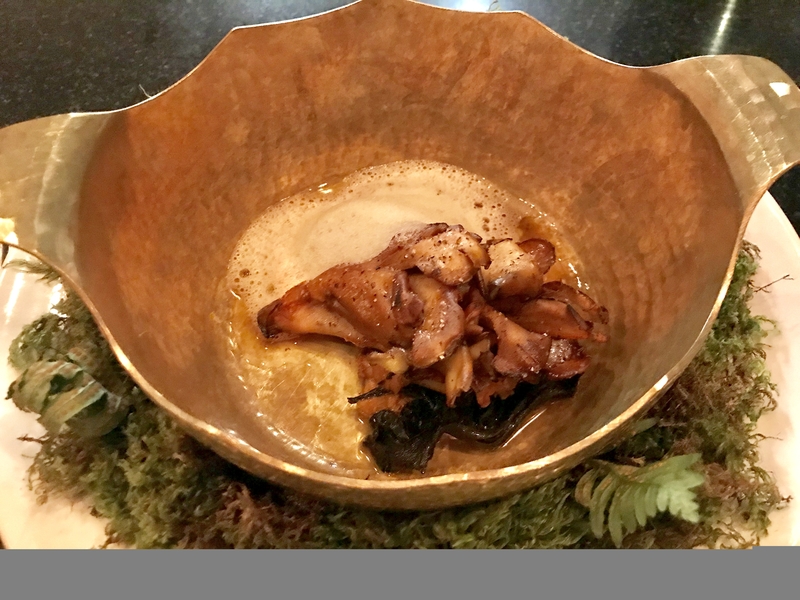 “When we went foraging with Francis Paniego,” says Curtis, “we got so many mushrooms. But we didn’t even try to bring them back with us; we were sure customs wouldn’t let them into the country. These are California mushrooms.” Still, when he lifted the lid from the pot, the aroma took me straight to Spain. I love old white Riojas because, unlike most white wines, they aren’t afraid to show their age. 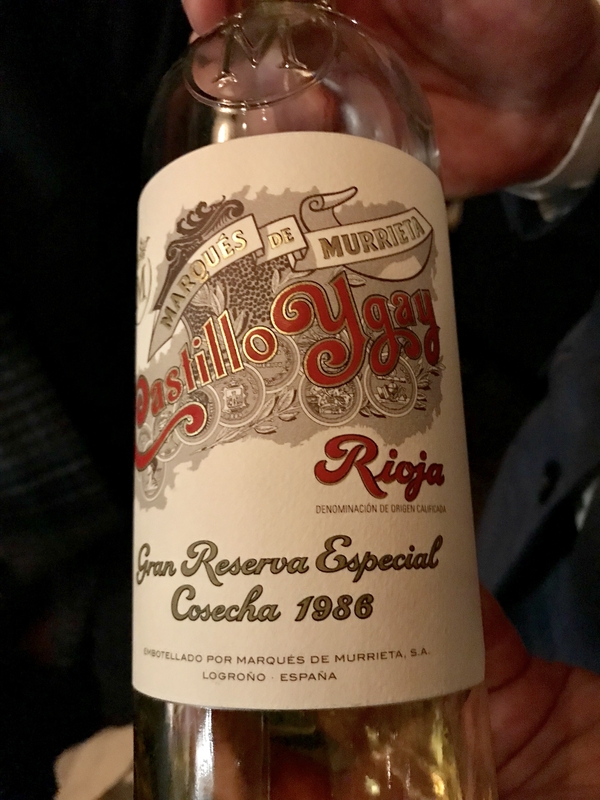 The Marques de Murieta Castillo Ygay Gran Riserva is a grande old dame, and also one of the most appealing white wines I’ve ever sipped. Still lithe and graceful, it has the special dignity of its many years. 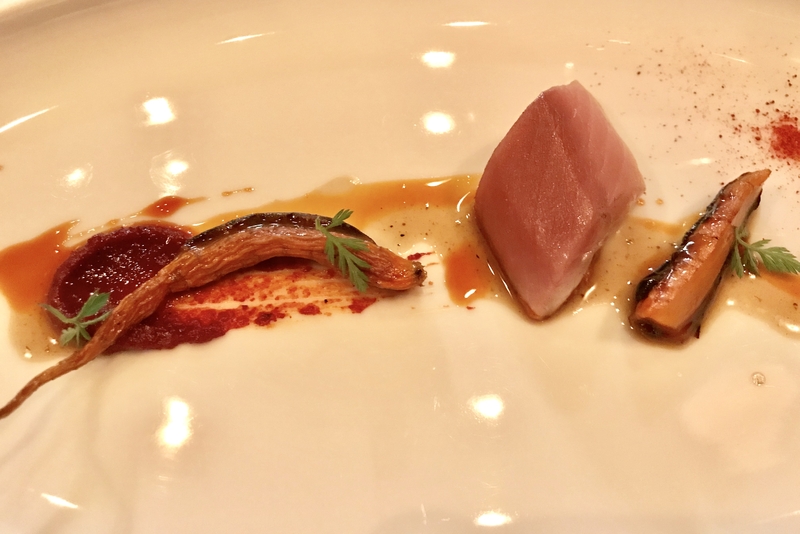 Next up, a couple more aged creatures: bonito and carrots, cured to mimic classic Spanish conservas. And a fascinating wine from one of Rioja’s most modern winemakers, Tentenublo Xerico, 2015. Do you ever dream of beans? 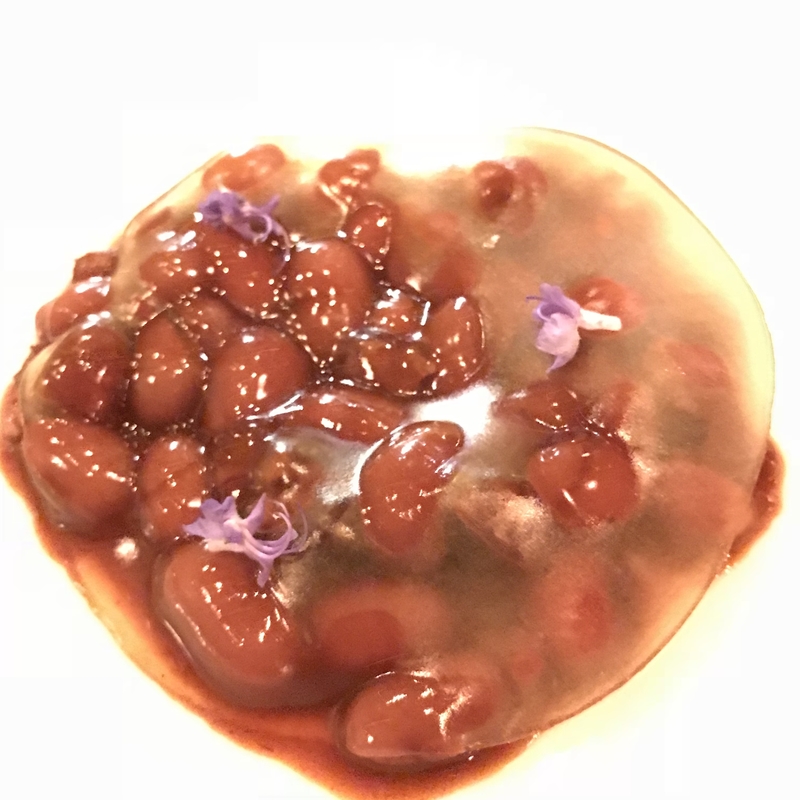 I could not forget this classic Rioja stew – the local red caparron bean cooked with chorizo. 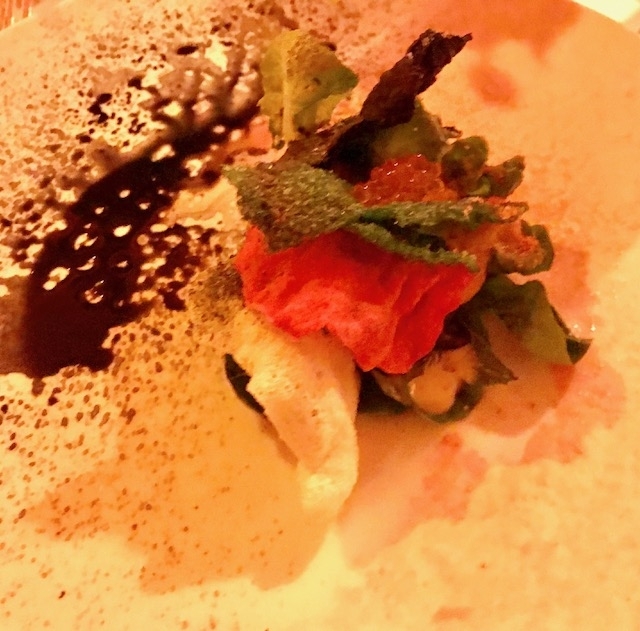 To the chefs it recalled a dinner with Juan Carlos Sancha. 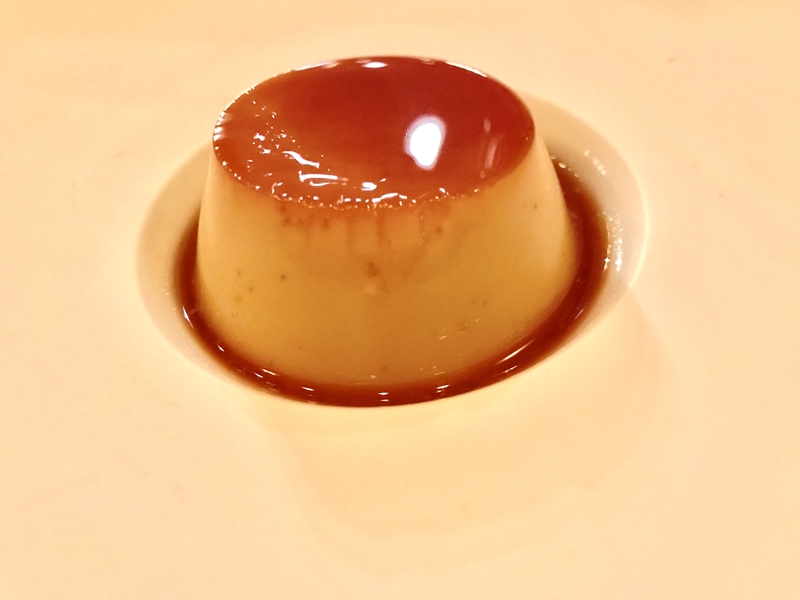 To me it was a journey to a wonderful place, layers of fat and flavor that reverberated through my body. It arrived with a misty coat that slowly melted away to reveal the beans. 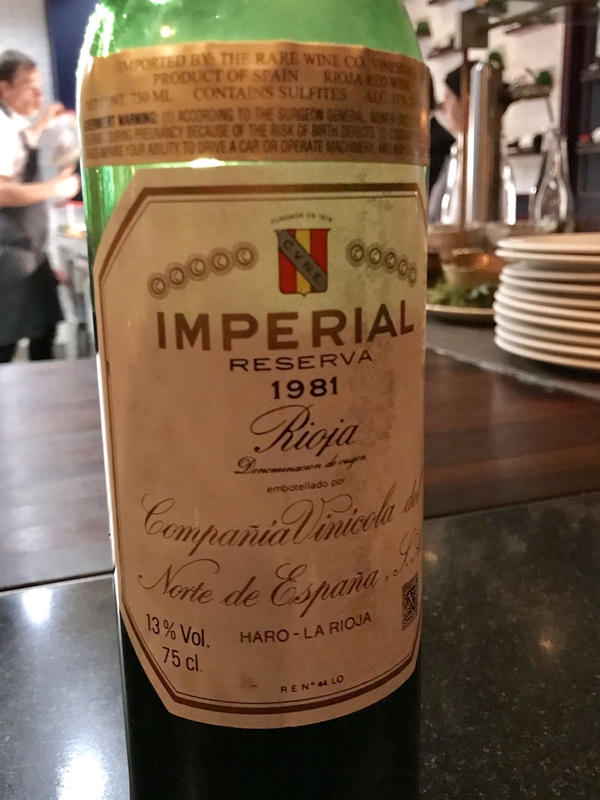 I loved the respect the chefs showed this humble dish: the caparrones were served with a truly majestic wine – C.U.N.E Imperial Riserva 1981. 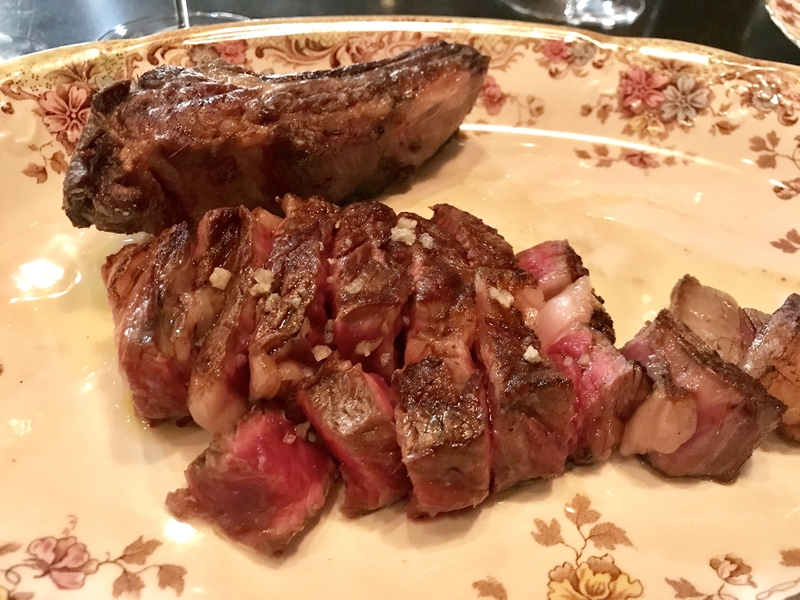 And finally the classic chuleton of Spain: a righteous piece of meat that had been beautifully aged. With this, a wine that is Rioja in a different mood: Artadi Pina El Pisan, 2006. Don’t miss the wine. Don’t miss the meat. And don’t miss them together. 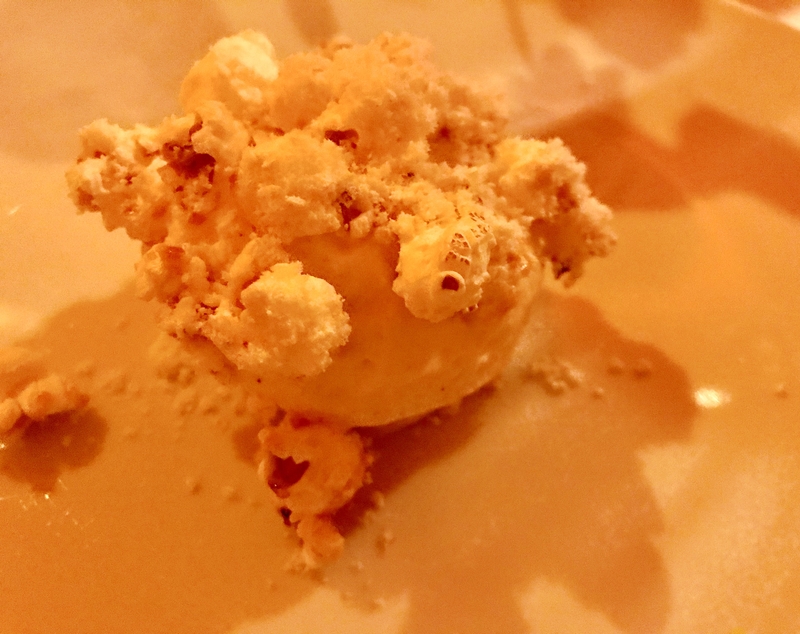 By now I was so happy I forgot to shoot the first dessert: sheep’s milk curds with cherry and salted almond. 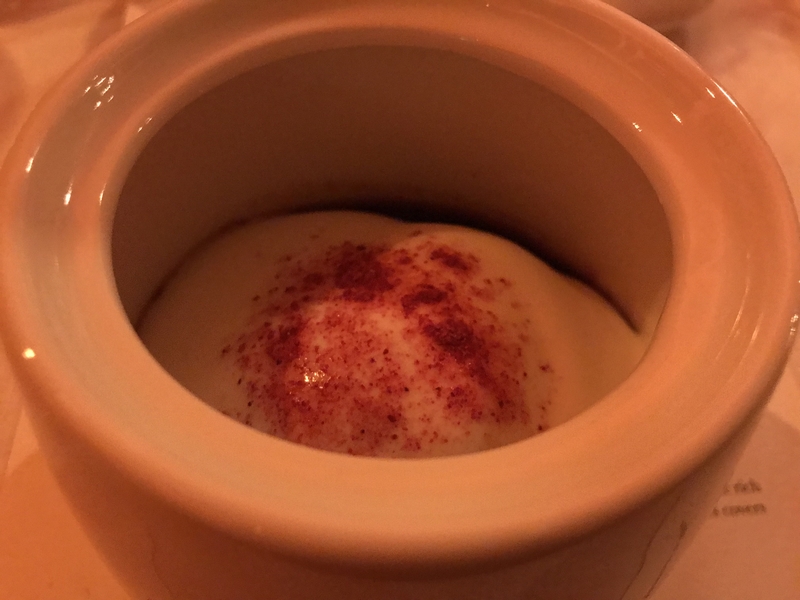 But by the time the classic crema catalana came around I had recovered. Served with a rare sweet Spanish wine, Bodegas Tritium Mercator, it was a lovely final flavor. 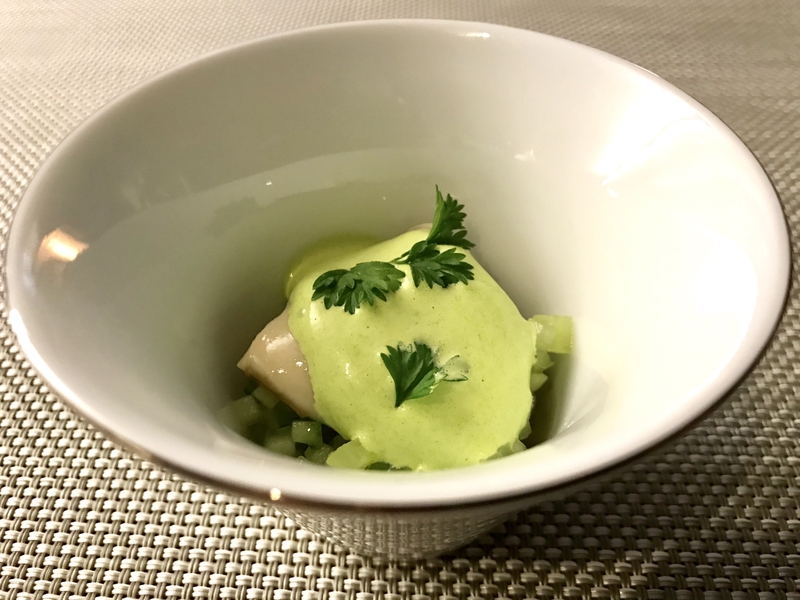 And should you be interested in a bit more of Spain… I was in nearby San Sebastian last year, where I had some of the most wonderful food of my life. You can read about it here. Getting a seat at Wolfgang Puck’s Rogue Experience isn’t easy. There are only eight seats at the experimental laboratory counter, and when I tried to snag one it turned out they were taken for the foreseeable future. 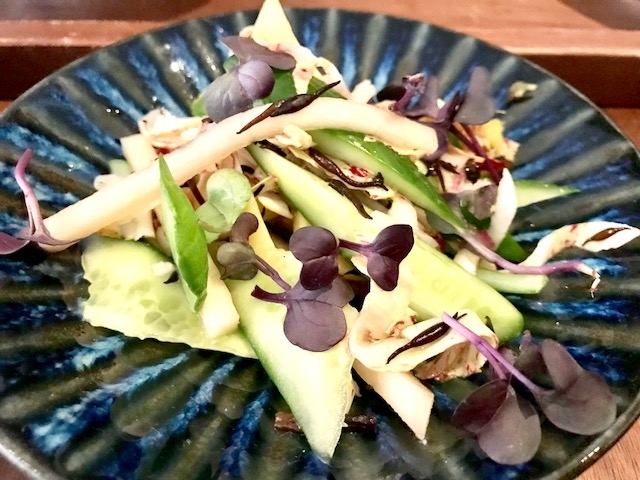 But I was really curious, eager to find out how this venture into the future of food stacks up against other LA places like Vespertine and Dialogue (going next week). And I’m not beyond begging. The fact that I’ve known Wolf for almost forty years (I spent an entire year writing about the opening of Chinois for New West Magazine), undoubtedly helped. A seat was found for me. It certainly doesn’t look like any other restaurant in the world. Hidden inside the Puck corporate offices in the Pacific Design Center, you are led through a labyrinth of designer shops into a cozy den that might belong to anybody. Behind the bar a mixologist stands shaking drinks with manic energy. 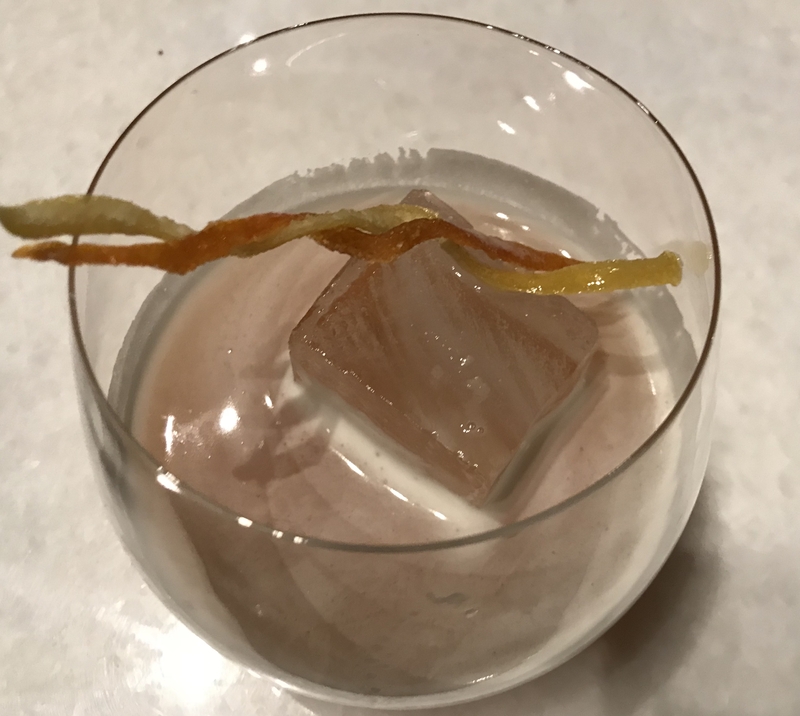 The Rogue 35 (this is the restaurant’s thirty-fifth week), a mad combination of Scotch, honey, pomelo, grapefruit juice (even ice cubes made from grapefruit water), is the opening shot. 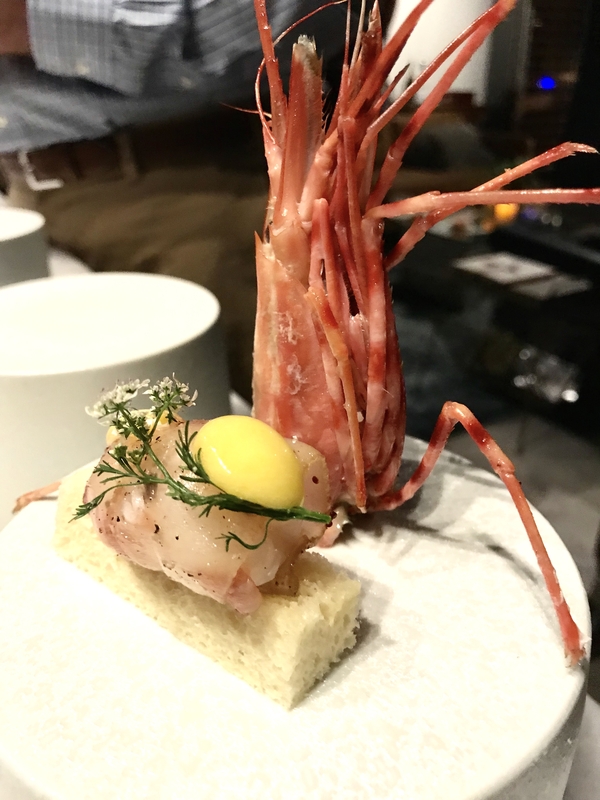 Nearby a couple of earnest young chefs ply their tweezers, and after you’re introduced to your fellow diners you stand around the counter casually eating their offerings with your fingers. 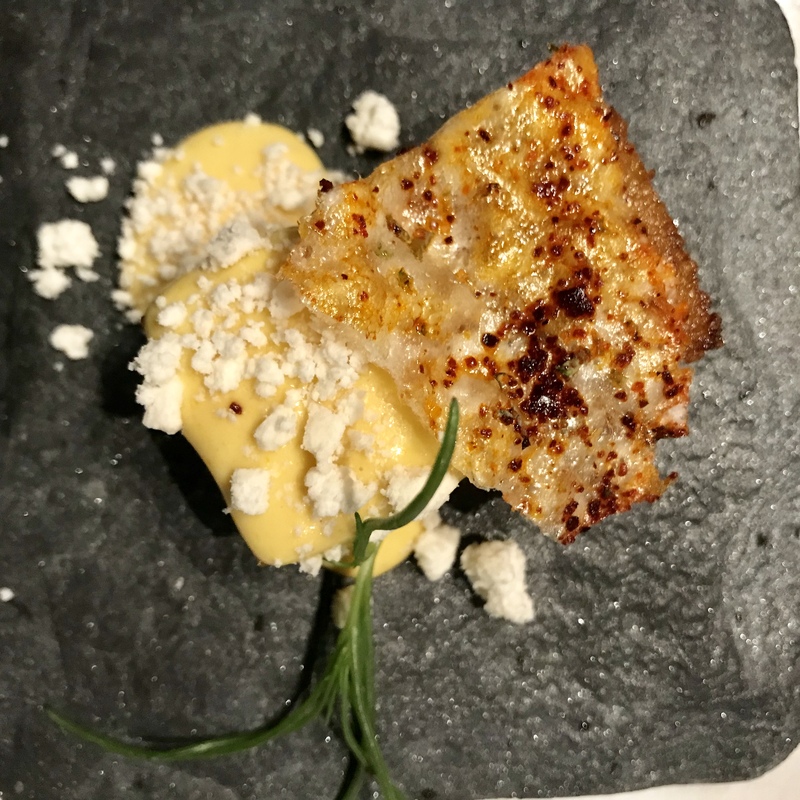 First up is this fantastic corn concoction, a kind of fresh polenta topped with chicharron and aji amarillo. 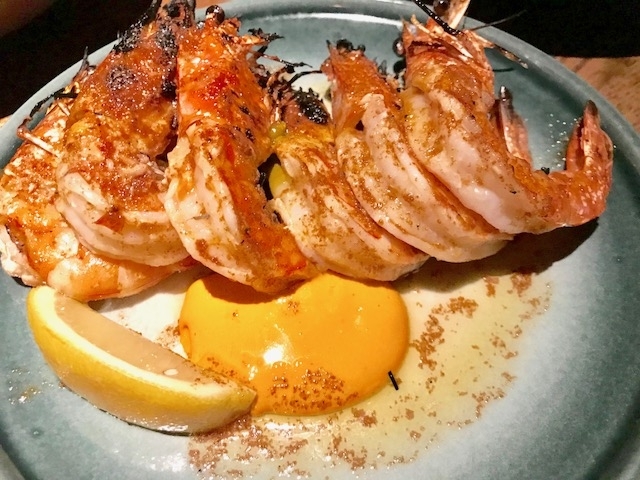 This spot prawn, fresh from Santa Barbara, is set on brioche along with its roe and a little hit of kumquat. Still, it’s the head that knocks me out. Now we’re led through a large kitchen filled with space age tools that look like they’d be more comfortable in a science lab than a kitchen. It’s a wonderland of centrifuges and anti-griddles. Then it’s on to the counter, where still more chefs are busy at the stoves. Despite its name, Rogue has an overarching sweetness; it seems to be Wolf’s way of giving the people who work for him the ultimate cooking experience. 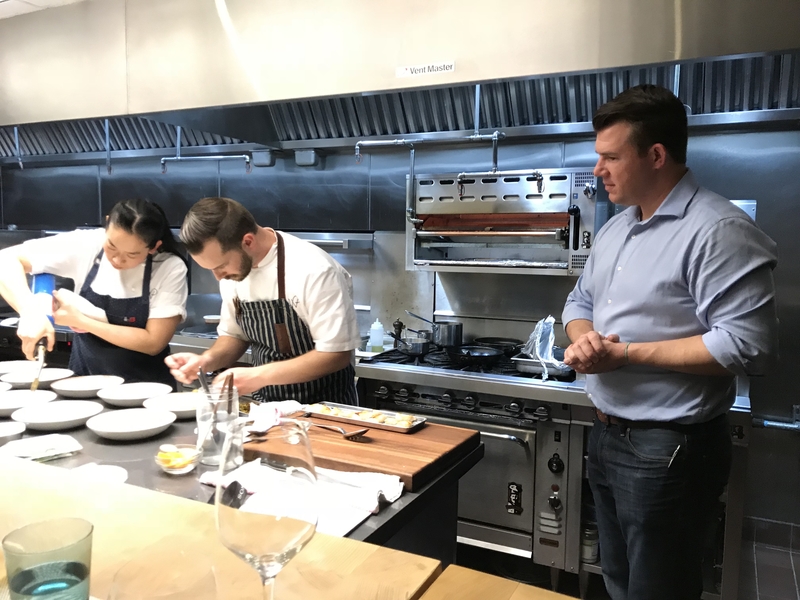 He invites chefs from his far-flung empire to come for a week and gives them a single mission: find great ingredients and use them in innovate ways. The catch: each dish has to be something they’ve never cooked before. Money, it seems, is not an object. And a professional photographer’s on hand to catalogue each dish. 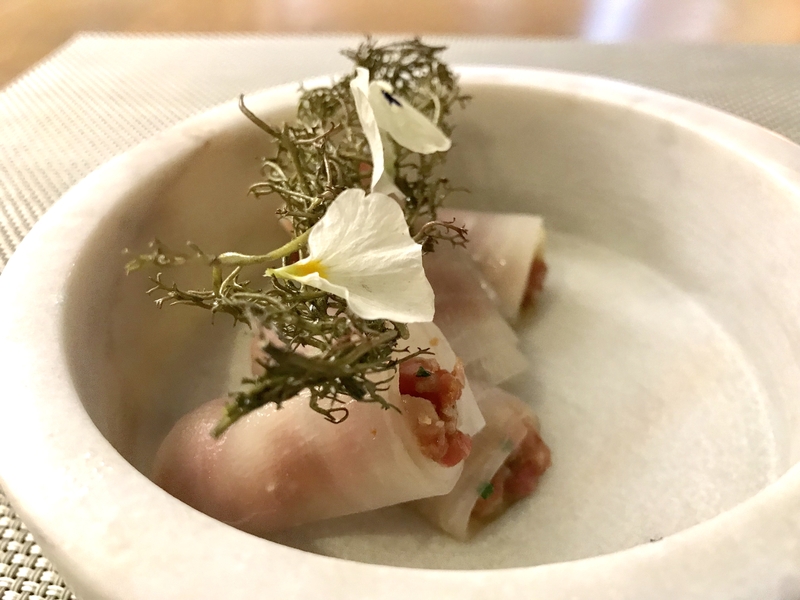 The menu changes weekly, but tonight the first dish is this take on steak tartare, the coarsely chopped beef rolled up in daikon and topped with dry-fried seaweed. The seaweed is a truly inspired touch. Oysters are next, little gems set in a puddle of pancetta stock and topped with a green garlic mayonnaise. I’ve always thought oysters Rockefeller ought to be retooled for the 21st century: now it’s been done. The next dish is greeted with oohs and ahs. Then an awed dead silence ensues. Yes, it is truly that delicious. 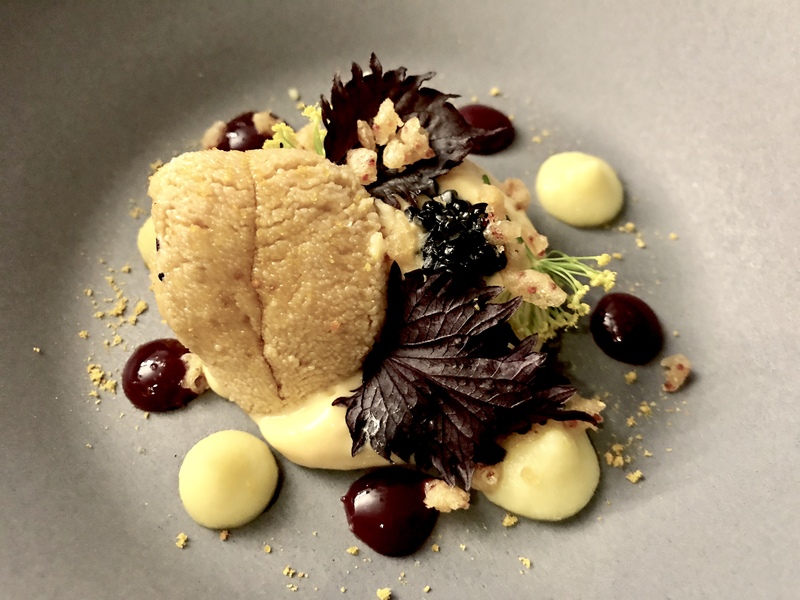 Sea urchin, yuzu mousse, caviar… But the truly elegant touch is those sweet-sour little red dots dancing around the edge. 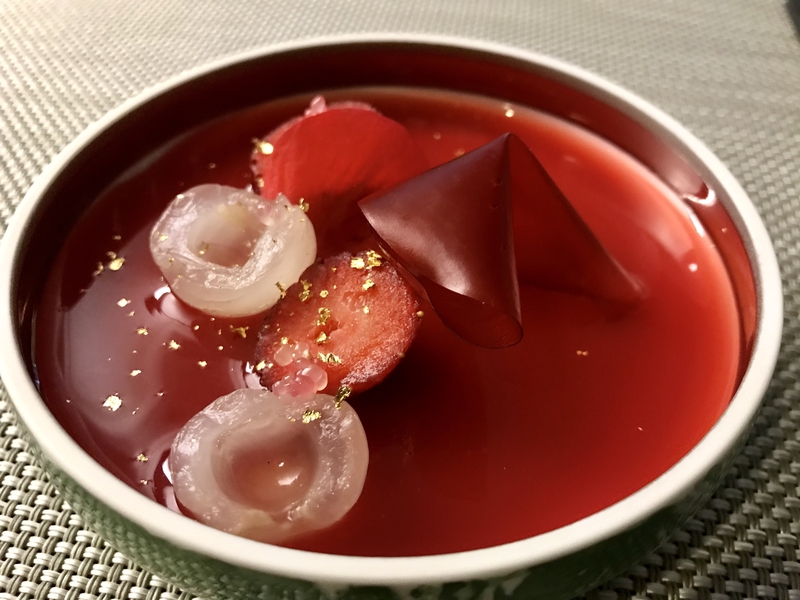 A mixture of umeboshi and beet puree, it frames the flavors in the most intriguing fashion. 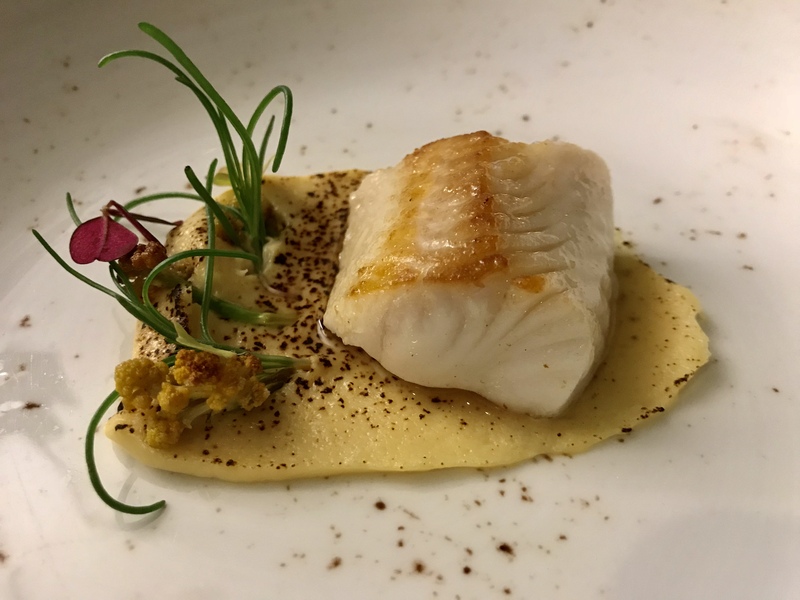 Black cod, the most luxurious fish, is simply served on a puree of parsnip and miso, garnished with sprouting broccoli. 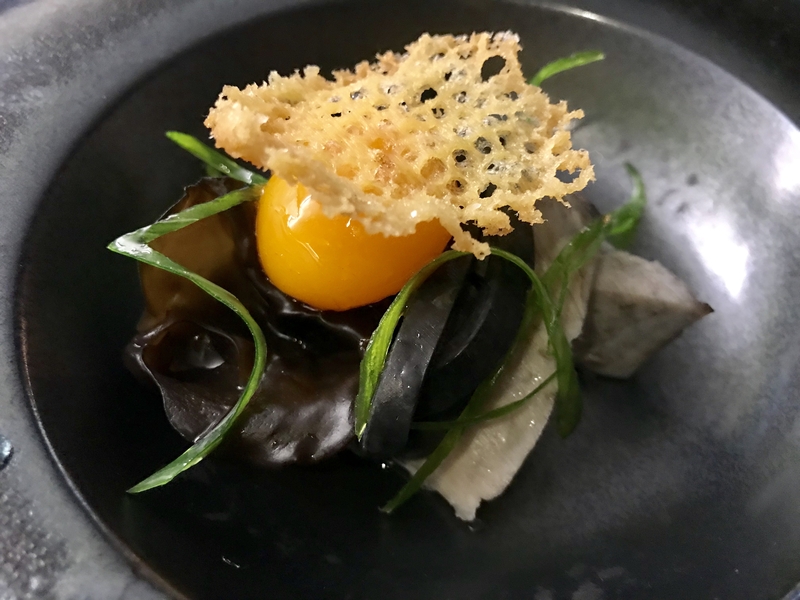 The little lace cap of egg is a treat. And that deep, rich broth! I taste chicken, pork, bacon, roasted onion, scallion, a hint of ginger. More please. Chef Jenny calls this “accidental pasta,” and it is like none I’ve ever tasted. 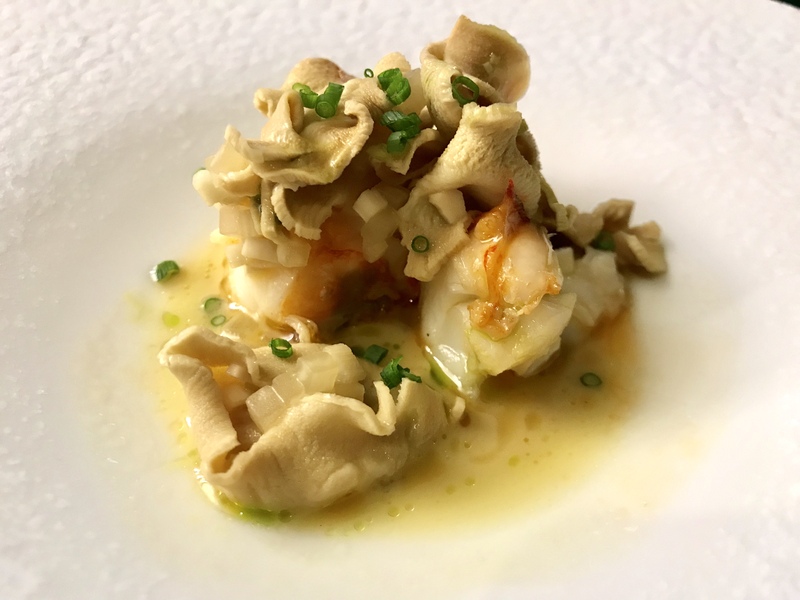 The texture reminds me of dried tofu, and the entire flavor profile – dashi, bamboo, spiny lobster – is more Asia than Italy. 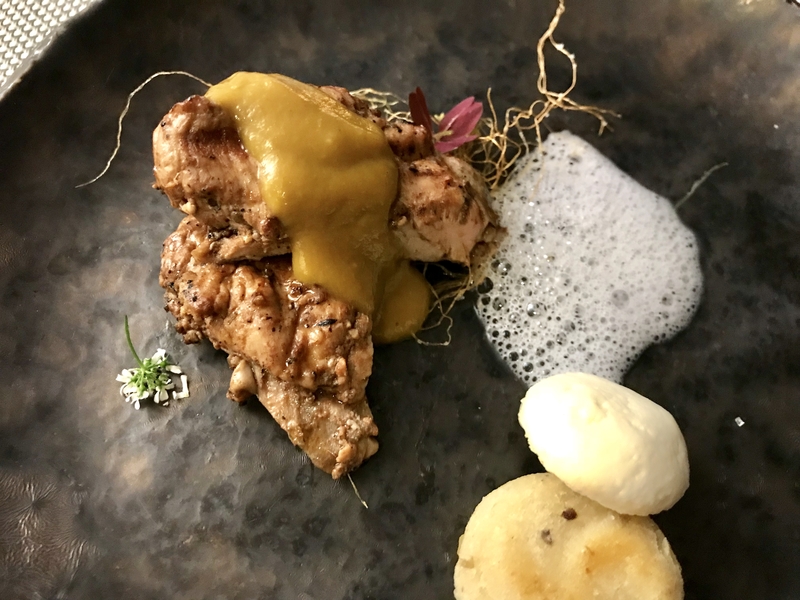 Back to Mexico for the quail, with its cake made of masa, its queso fresco, its garnish of corn silk. 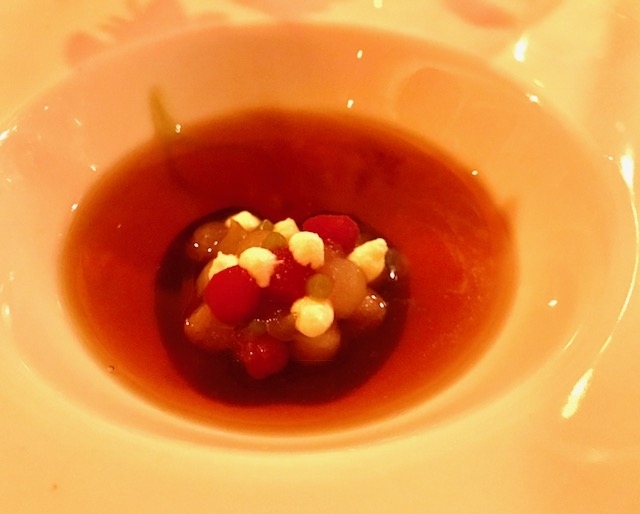 Foie gras mousse with strawberry glaze and litchi. Need I say more?Let me just add that the little fortune cookie made of dried strawberries is a fine surprise. What is this strange wiggly black thing? 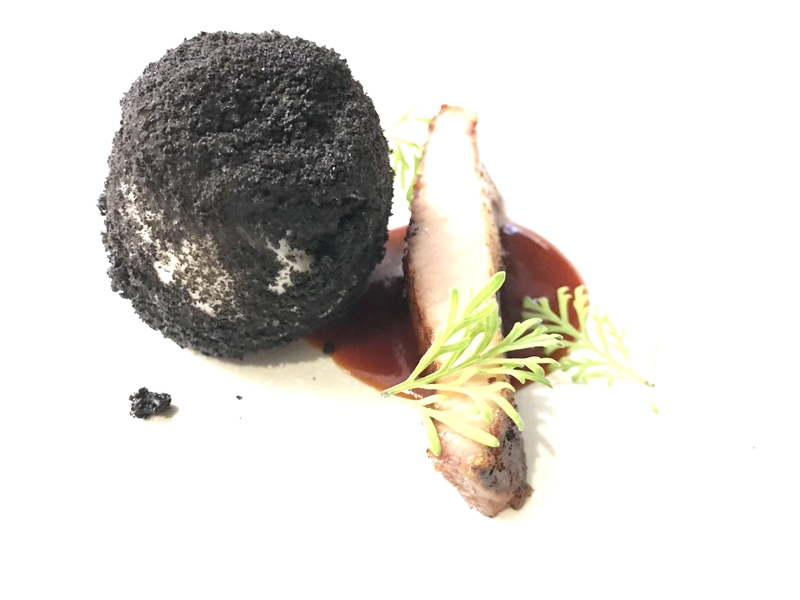 An egg rolled in burnt brioche crumbs! The pork jowel on the side has been zapped with gochujang. Absorbing and delicious. “Were an amusement park,” says Chef Micah as he helps compose the next dish. 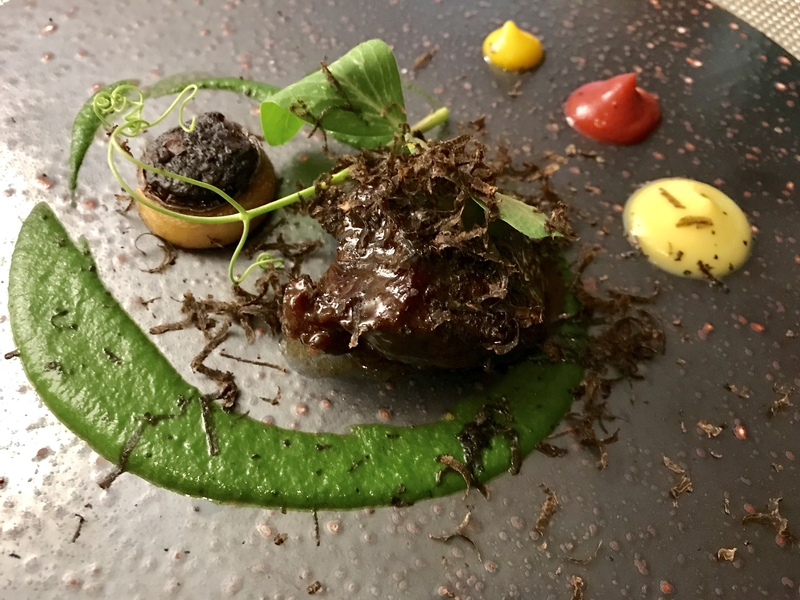 “We’re trying to give you a roller coaster ride of flavors.” This must be an e ticket: spoon-soft beef cheeks with truffle, peas, pea leaves and carrots of many colors. On to dessert. Can I eat another bite? This treatise on coconut, all texture and temperature, proves irresistible. 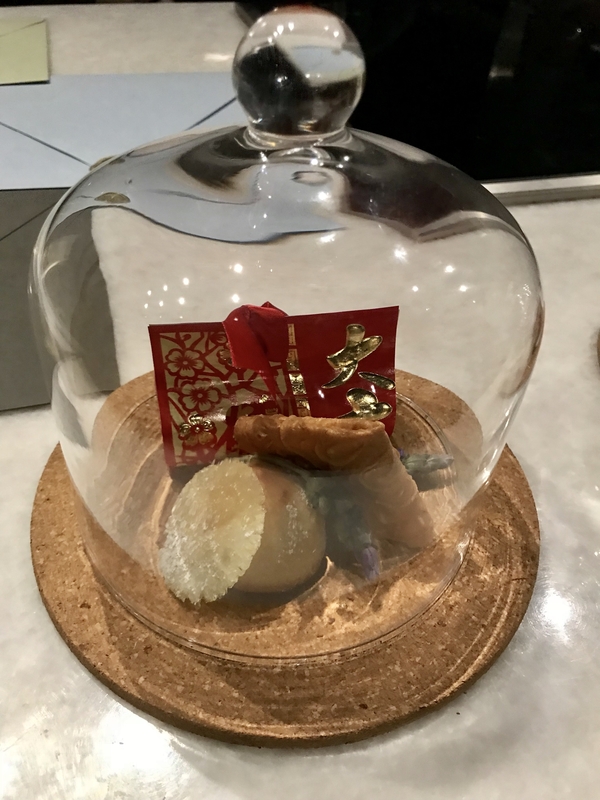 Tapoica, young coconut, and coconut ice in a chocolate shell. On the side, a roasted banana. To my astonishment I inhale every morsel. And finally the single most seductive strawberry shortcake I’ve ever encountered. 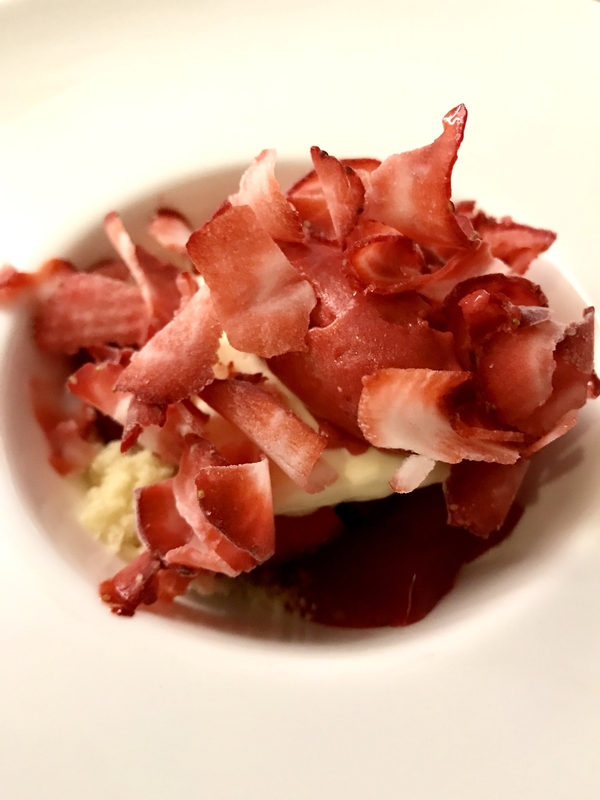 Strawberries frozen into ruffles, cooked into gelee, served with sheep milk sorbet. It’s like shy little Cinderella after she’s been touched with a magic wand. There’s more. 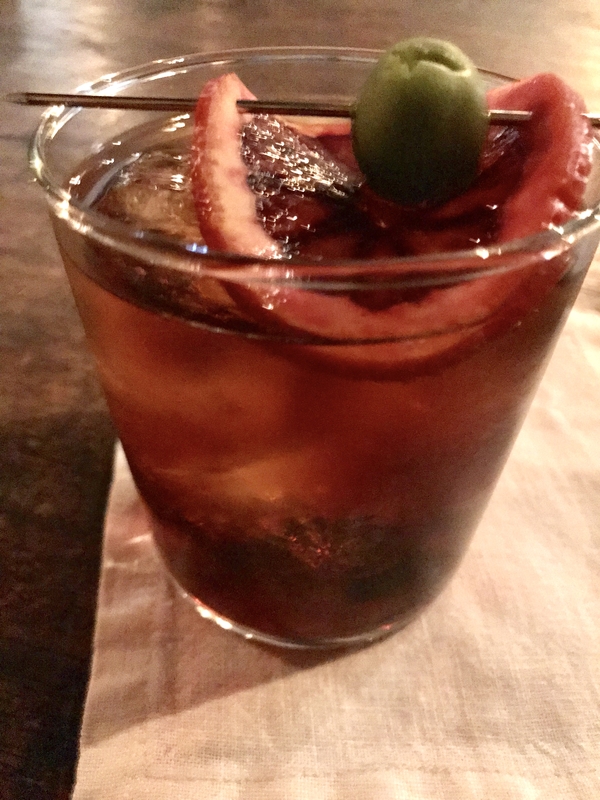 A trip back to the den, for more drinks and this little parting gift of pineapple, brown butter and pecan. One of the qualities I’ve always admired about Wolf is his unerring talent for management. People stay with him for years, sometimes their entire careers. As the team – Joel, Micah, Jen, Jett, David, Erik, Jay, Jenny, George and Alan – wave a cheerful goodbye I suddenly get what is unique about Rogue. It’s the first restaurant I’ve ever encountered that isn’t about you. It’s about them. About encouraging them, about giving them a chance to develop their talents. But if we’re very lucky, we get to go along for the ride. Among today’s hero chefs – and they are a growing group – two people really stand out. Jose Andres, who’s showing the world how private citizens can deal with disaster if they have the heart, the will and the energy to do it. His work in Puerto Rico makes me proud to be human. And Massimo Bottura, who’s making it his mission to enlist fellow chefs to feed the hungry all over the world. 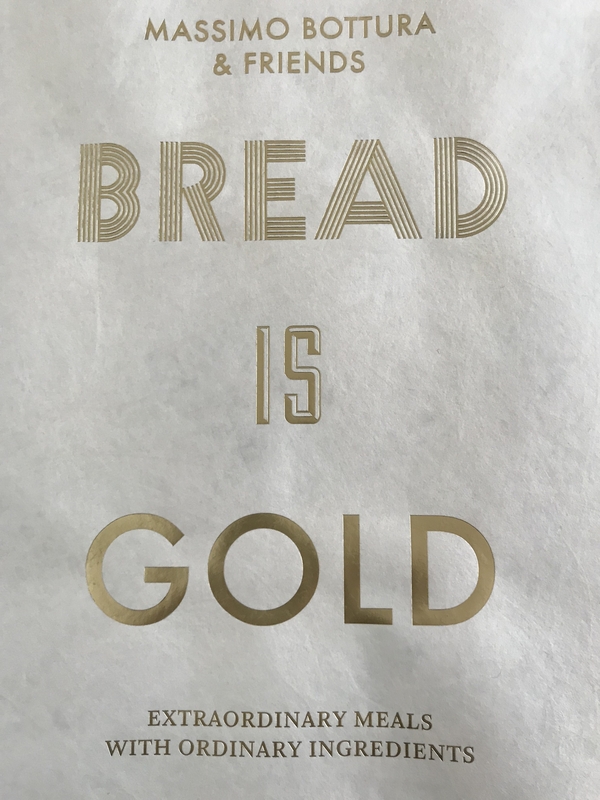 Massimo was in Los Angeles last night, raising money for his foundation, Food for Soul (and also the Los Angeles Regional Food Bank), and to celebrate his new book, Bread is Gold. A perfect description of one of my favorite Massimo dishes. A playful take on the East Coast lobster roll puts tradition on the back burner. 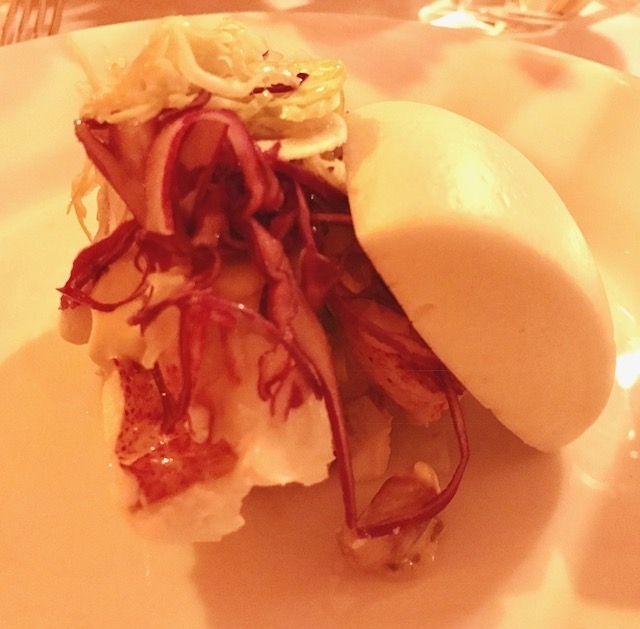 The hot dog roll is substituted with a Chiense steamed bun filled with fresh Maine lobster and dressed with crustacean sauce and marinated vegetables. What you’re missing here is the fragrance; the scent of oranges went wafting across the table in the most seductive fashion. Cracker Jacks on a visit to Antartica. Cold, warm, sweet, salty. Very fun. Have you ever seen a prettier shrimp? 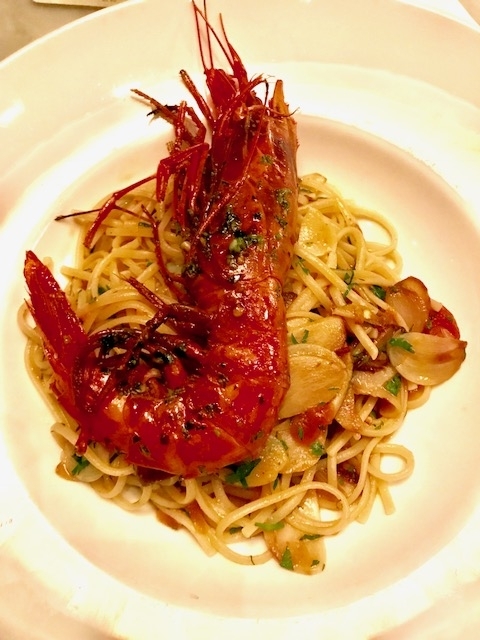 It’s on the menu at Osteria Mozza: one giant prawn on a plate of pasta. You pull off the head and allow the drippings to shower over your plate. Then you eat the shrimp – with great delight – and finally twirl the pasta around your fork. So delicious. 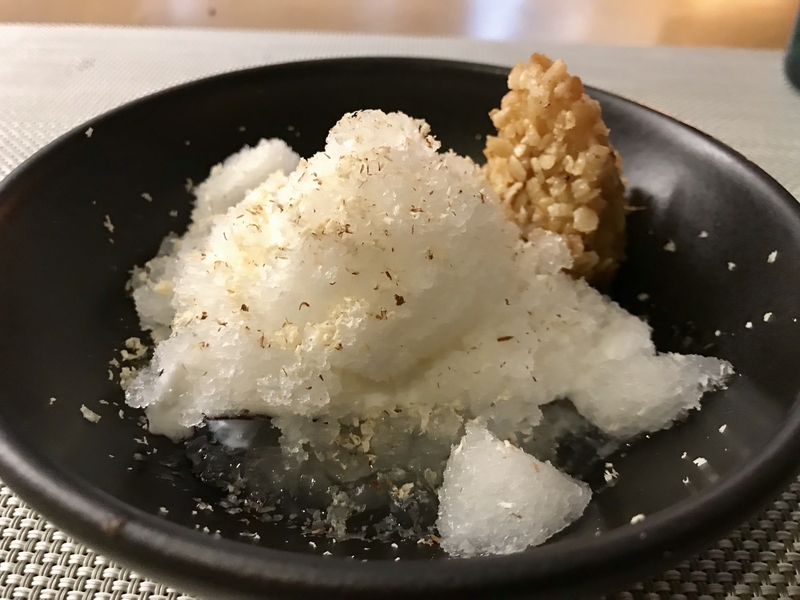 This is the satsuki rice porridge at Orsa and Winston, a wickedly delicious concoction that borrows from both Italy and Japan. 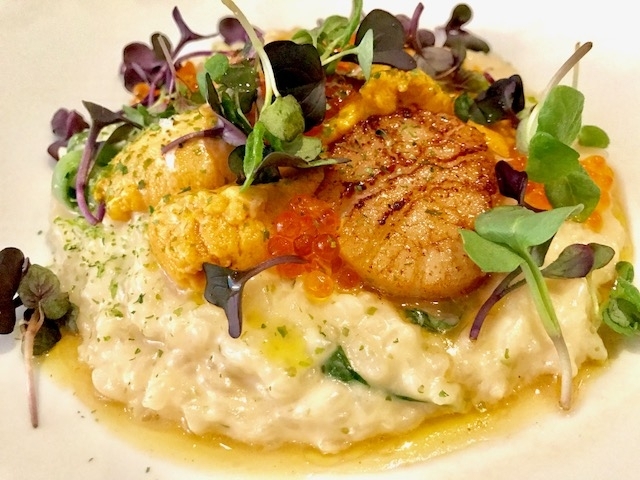 More rich risotto than spartan porridge, it’s topped with sea urchin, scallops, salmon roe. I couldn’t stop eating it. I loved the restaurant’s pickle plate too: each one so gently cured it retained its crunch. 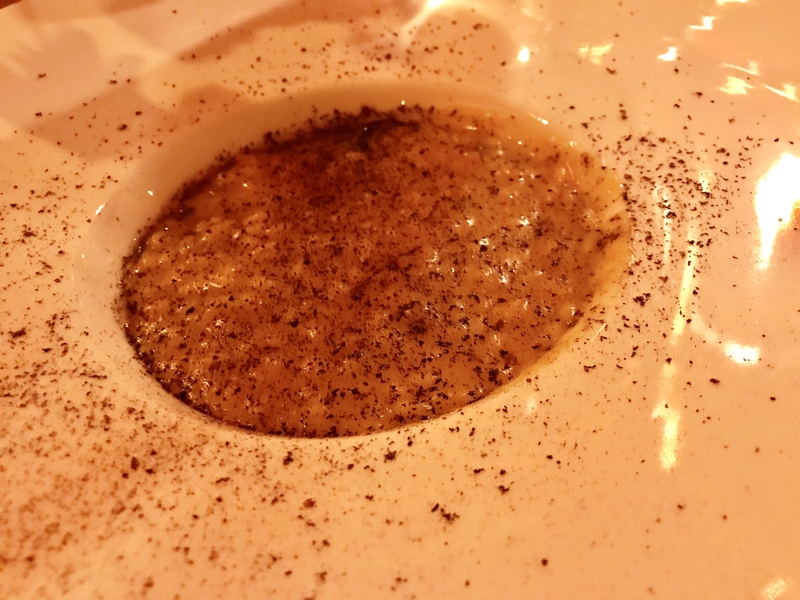 It was as if the word “vinegar” had been whispered across the plate. 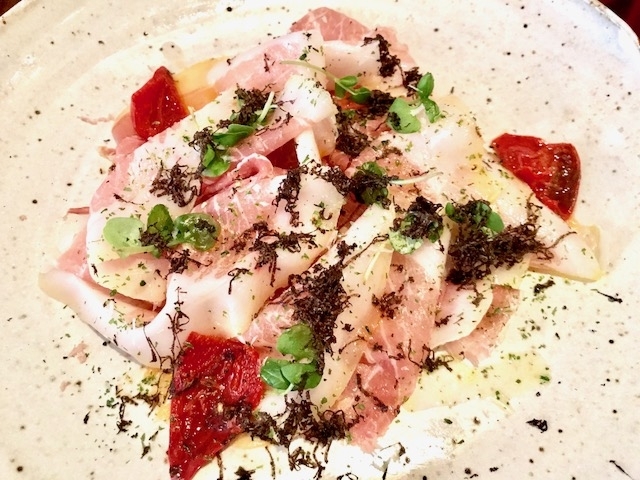 And the house-cured culatello is superb. 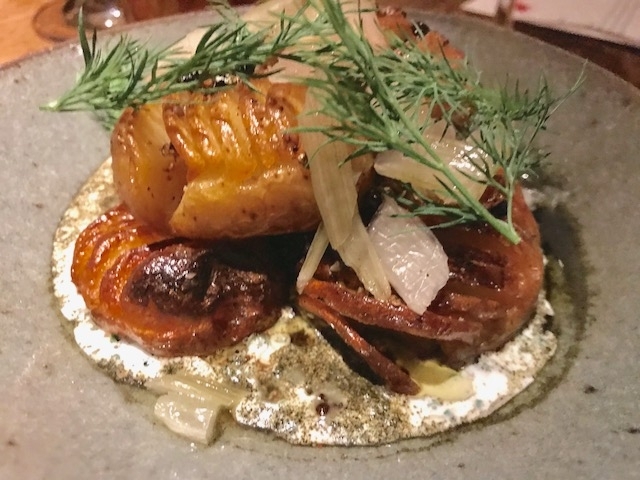 Stopped by Hearth and Hound for dinner one night. It’s one of the coziest restaurants I know, dimly lit, the table widely spaced so you can have a conversation. And on warm nights the patio is the place to be. 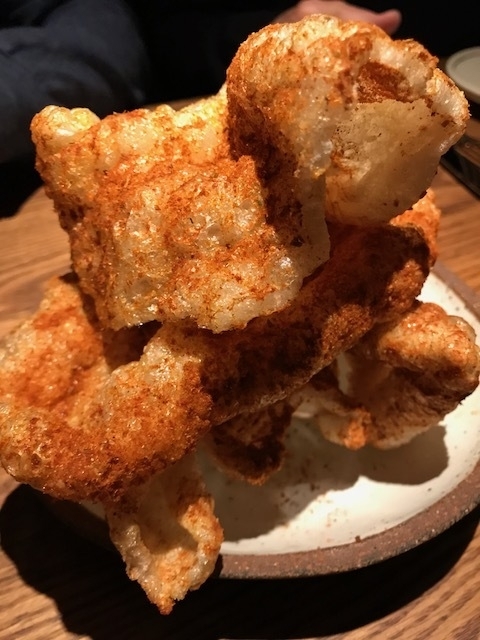 That spicy chicharron is a great way to start. 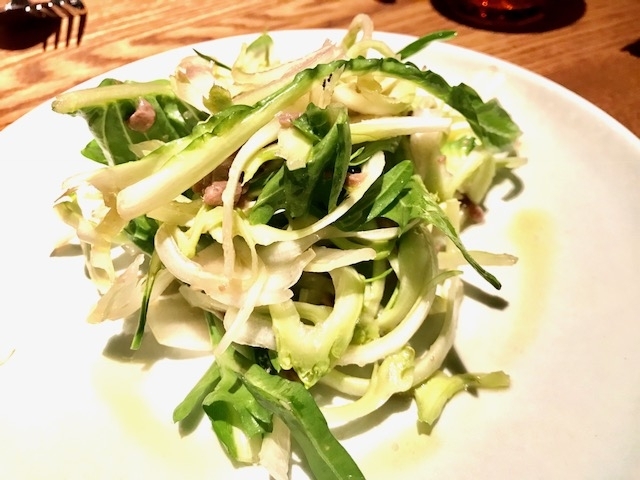 An admirable puntarelle salad revels in its anchovy dressing. There’s a wicked grill – flames leaping – and almost everything on the menu meets that fire. These shrimp perhaps? There’s no better way to get messy hands…. 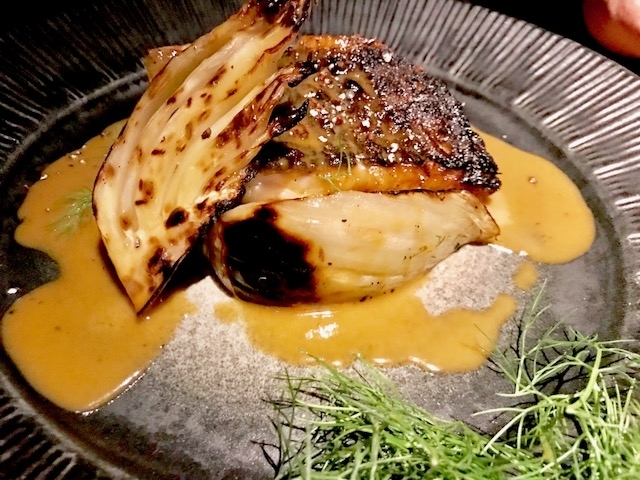 Black cod with orange sauce. 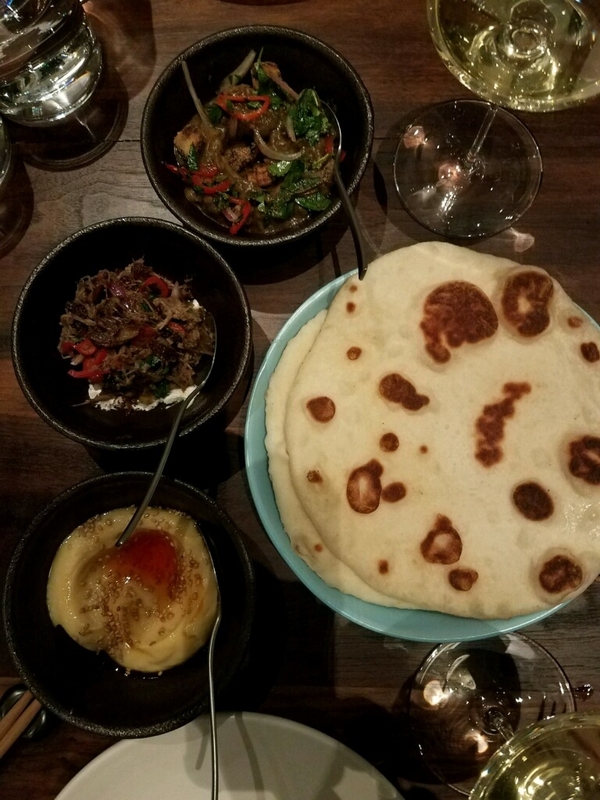 And if you eat nothing else here, don’t miss the charred cabbage. Laced with meat drippings and plopped atop a little oyster-scented puddle, it will change, forever, your notion of cabbage.